FONIX FP35 Touch Portable Hearing Aid Analyzer – Frye Electronics, Inc.
Ease and Accuracy with the FP35 Touch Hearing Aid Analyzer! Move your hearing aid fittings into the world of the touch screen! The new FP35 Touch adds a new interactive dimension to hearing instrument verification. Touch the screen to navigate to the desired test screen or to make changes to important settings. Swipe the screen and move to the next one or call up local menus—real control at your fingertips! Real-ear measurements can be performed conventionally using the newly improved Digital Speech signal or you can use Visible Speech with live or pre-recorded actual speech signals. Switch between using the built-in signals and the Visible Speech signals with a simple touch to the screen. Want to see the exact sound level values at the ear? Switch between the graphical and numerical displays with another simple touch of the stylus. The fitting formulas available on the FP35 Touch include DSL i/o, NAL-NL1, MOD NAL (for mild/moderate gain open fit aids), and the usual linear fittings rules. Two simple swipes from any of the real-ear measurement screens will bring up the target menu and allow you to adjust the formula settings. Return to the measurement screen with a closing swipe. 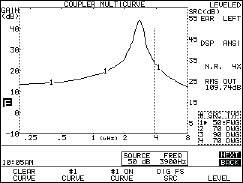 To create coupler targets customized to the patient’s ear response, measure the real-ear to coupler difference (RECD). This allows you to simulate real-ear measurements while providing the convenience of sound chamber measurements. 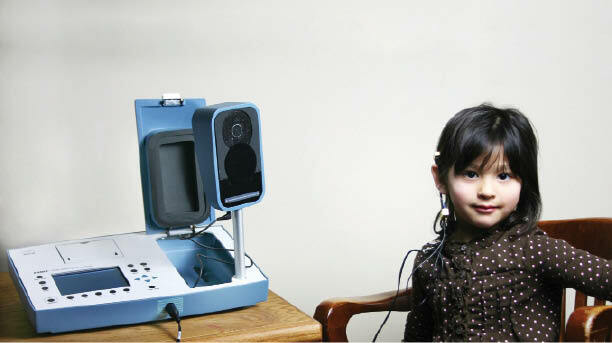 This technique was developed primarily for fitting hearing aids on children, but it can also be a time-saver in pre-fitting hearing aids for adult patients before they come into the office for their fitting. It is even more convenient and accurate if you use the FP35 Touch Audiometer Option to measure the patient’s threshold levels. The FP35 Touch comes with your choice of automated test sequence: ANSI (American), IEC(European/International), or JIS (Japanese). If more than one test sequence is desired, just specify it with your order for a small additional cost. A larger external sound chamber is also available as an option. Some advanced hearing aids have the capability of transposing amplification in high frequencies (that may be inaudible to your patient) to lower frequencies where your patient can hear them. The FP35 can test these hearing aids with the special DIG FS test signal. 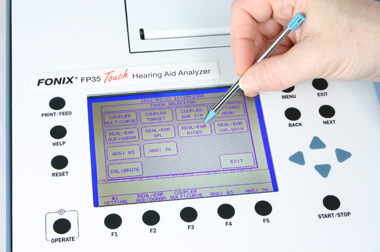 The input frequency is shown as a vertical line on the test screen while the hearing aid response is displayed normally. This allows you to easily see the spectral shift of the hearing aid. The FONIX NOAH Real-ear Module can be used to control your FP35 Touch from a connected computer. The NOAH REM module automatically grabs your patient’s latest NOAH audiogram and uses it to generate NAL-NL1, DSL mI/O, or MOD NAL targets. Each measurement performed with the REM module can have its own target, which makes your hearing aid fittings even easier and more convenient. If you prefer to perform your test results from the front panel interface of the FP35 Touch, you can use the NOAH REM module to grab existing test results from the FP35 Touch and store them into your computer. The FONIX Troubleshooter program, also a NOAH Module, is used to measure and store coupler test results including ANSI, Profiler, and coupler multicurve. See the FONIX NOAH REM and FONIX Troubleshooter brochures for more information. The FP35 Touch has recently been upgraded with a faster thermal printer that copies the screen to paper in just a few seconds. You can also print test results to a standard printer using one of the FONIX computer programs, if desired. An optional soft carrying case is available for the FP35 Touch for easy portability.